The Forum News Get Movin? Move it. That’s the only coaching advice that I’m giving you for 2019. Daily movement, any movement, is the key to your short-term and long-term health. You know this intuitively. When you rise, ever so slowly, from your chair and shuffle around the house after sitting around all day, your joints are cranky and your muscles feel weak. When you’re cooped up on a plane or car ride and ready to hit the ground running as soon as you arrive, your body and brain are telling you to move. Physical activity, in any form, will help you deal with stress, change your mood, improve cognitive abilities, increase bone health, strengthen your muscles, decrease your risk for cancer and heart disease, mitigate the effects of chronic disease like diabetes, and ensure a life of independence. 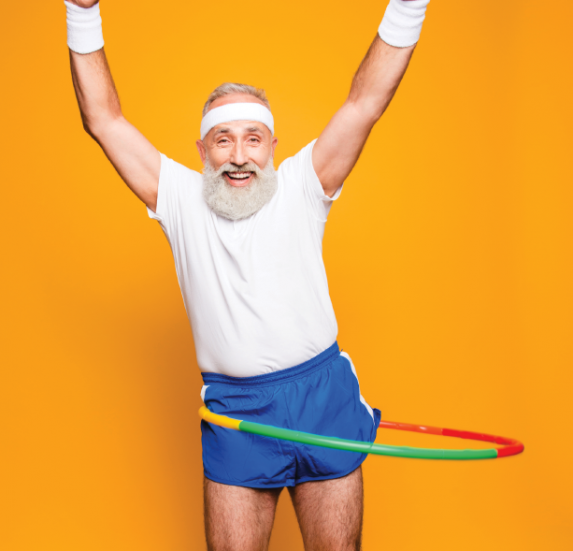 For baby boomers and Gen X folks especially, daily movement supports a well-functioning body for daily activities on the job, traveling, caring for grandkids, home maintenance, as well as decreasing the risk of falling or improving recovery from injuries related to falls. Research from national centers like the CDC and NIH show the importance of frequent bouts of movement throughout the day that does not necessarily equate to our standard societal views of what “exercise” means. This is important because it gives busy people the opportunity to feel empowered to take control of their health when they do not have time to schedule an hour in the gym each day. Not only that, you have the chance to redefine what physical activity you want to do and like to do, and how to combine activities in your life that enhance your health in a more integrated manner. The NIH National Physical Activity Guidelines for Americans promotes 150- 300 minutes of moderate-intensity aerobic exercise each week for adults. This can mean playing with your grandchildren and pets so you can combine quality family time and activity. Walking while you have meetings can get you out in day. Other people need to make an effort to include resistance training at home, outside or at a gym. Sometimes, muscle-strengthening activities are a natural part of your life, like gardening or at-home projects. Other times, you might incorporate rounds of body weight exercises like squats or walking lunges, or use specific equipment, such as resistance bands or dumbbells. Making daily movement easy the sunshine when your team might and fun in your life will help you be usually be confined to the offices. There are even apps that facilitate active meetings. The Guidelines also suggest two musclestrength training, or resistance, days per week to truly improve balance, strength, coordination, agility and power. Why do you need all of these? To stay independent! This is my number one goal for all of my clients, no matter if they are 30 or 60. Many people have jobs that incorporate some type of strength work throughout the consistent. This is the most important factor when it comes to reaping the benefits. Public health theories on behavior change show that creating community and accountability around your activities are key factors for maintaining consistency. Find a great personal coach, fitness class, or meet up with a friend to keep you on track. Coaching and instruction also give you the know-how to progress your aerobic activity and strength program, thus maintaining and improving your fitness. Choose a venue or coach that you can easily get to, like your backyard, a friend’s garage, the YMCA or local park. Before you get moving, also consider your recovery time and ability. As an older human being, daily movement may not come as easily. It may be harder to return to baseline again after physical activity. This is normal so have compassion for yourself. This is why shorter, more frequent movement times throughout your day are crucial. Stop every hour and do a quick one- to two-minute jumpstart on your body, especially if you’ve been staring at a computer. Anything will do – stretch your arms in all directions, or shadow box, or do knee raises. Create habits around daily movement by adding it to your calendar notifications or get a creative app to track your steps and do a daily step challenge with friends or coworkers. Use technology to your health advantage. Let your kids and grandkids help you. This is another way to integrate the activities in your active life. Tech companies are on the cusp of creating massive innovations to how we track and have access to our own health data. This is one of the largest-growing fields in the nation because Americans are ready to move and take control of their health care! Move it. Dance. Play. Enjoy your independence. Maintaining it is up to you. Lori Panu, MPH, is the founder and owner of Be the Light Fitness, LLC, specializing in helping people improve their lives through fitness and health coaching. Lori is a public health professional, strength and conditioning coach, and research coordinator. If you would like to contact her, write to coach@bethelightfitness.com.